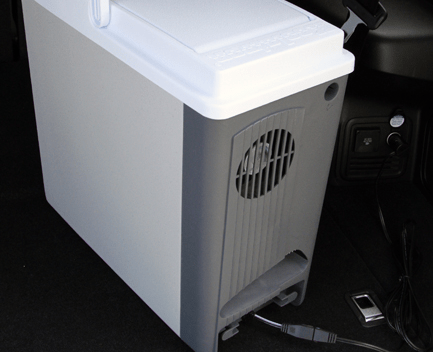 The family cooler used to be reserved for keeping food and beverages cold during family road trips, camping excursions and visits to the local ballpark, but times have changed, and so has the cooler. I recently received a clever cooler from a Canadian company regarded by many as the leader in the field of producing 12-volt, portable coolers. Koolatron has been producing its wares for a very long time, so it should come as no surprise that their catalog features a wide variety of shapes and sizes better suited to the modern automobile than the traditional plastic or foam brick you grew up with. My sample is the 17–litre Koolatron P20 Compact model which is tall and narrow so that it can slip into the foot well behind the driver or passenger seat, or even occupy the floor area between the front seats in some vans and SUVs. It features a flip up lid that is hinged at the back so that it will flip up out of the way but still remain attached to the cooler. How does the Koolatron P20 Compact Cooler work? Operation is simple, as the unit features a standard 12-volt cord which allows you to plug the device into either a lighter socket or an auxiliary power socket. Once plugged in you will hear the gentle hum of a small fan which plays a vital role in the thermoelectric refrigeration process which is employed to drop the temperature inside the cooler and chill your food and beverages. The Koolatron cooler’s thermoelectric cooling module has been designed to maintain a constant temperature of approximately 22 degrees Celsius (40 degrees Fahrenheit) lower than the temperature of the surrounding air. Conversely, you can also use the Voyager to keep food warm (or even heat food up to 65 degrees C (140 degrees F ) by simply flipping and reconnecting the power cord . Now here is the trick to making this device work a little more efficiently. It is unfair to expect that the device will chill your food and beverages quickly and effectively without a little initial assistance so I would suggest that you cool items down prior to putting them in the cooler. I found that placing a frozen gel pack in the bottom worked like magic for me. Also, unlike a standard cooler, it is important not to pack it too tightly as you want to allow for space between the items to permit the passage of cool air (or warm depending on your needs) as the unit operates using a small fan mechanism. You also need to be careful to keep other luggage, personal items and body parts away from the fan’s air intake/outlet in order to promote proper air flow and circulation. I found that it took between two and three hours for the unit to reach its optimal cooling temperature. One of my neighbours is a long time Koolatron user and he spends a lot of time on the road in the summer time. He suggested that if you orient the cooler so that the fan receives a flow of cooler air from the car’s air-conditioning system you will find that you get much better results. He also suggested that it might be wise to purchase the optional AC Adapter ($49.95) so that you can plug the cooler in prior to your trip to initiate the cooling process, but also so that you can take it into your motel room and plug it in to a standard wall outlet to use as a handy fridge. My neighbour also warned that it is not wise to let the cooler run for extended periods of time when the car’s engine is off as it is feeding off your battery. He had never personally had a problem, but recommended that a couple of hours would be about the limit for such operation. Koolatron offers an optional Battery Saver ($26.99) which switches off the cooler when it detects low voltage so that you will still have enough of a charge to start your vehicle. This solution would help ease your anxiety for those occasions when you may have to be away from the vehicle for more than a couple of hours. So far the P20 has proven reliable and very effective in the cooling department, but I have yet found the need to try the warming function. I imagine the latter would be really handy for transporting items to a pot-luck dinner or even heating up a pair of gloves or a toque in a pinch. It has suffered more than its fair share of bumps and bruises but its robust construction and durable case show little wear and tear. As a result, I can see this unit providing my family service for many years to come.